Not all dentists practice neuromuscular dentistry. 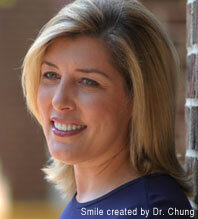 It is an approach to dentistry that looks at more than just teeth and gums. A neuromuscular dentist can diagnose and treat many painful symptoms that might otherwise be puzzling and resistant to medical treatments. If you have headaches, jaw pain, and other issues that affect your dental health and quality of life, Softouch Dental Care is here to help. Dr. Michael Chung has received advanced training in the diagnosis and treatment of TMJ, a common disorder that causes a variety of painful symptoms. Call our office today at 703-319-6990 for your free consultation. We welcome patients from Oakton, Vienna, McLean, and nearby areas of Northern Virginia. A majority of Americans suffer to some extent from the symptoms of temporomandibular joint disorder (TMD), which is a misaligned jaw joint. TMD is also abbreviated as TMJ, and the two abbreviations are interchangeable. Your jaw joints are in front of your ears, and you can feel them by placing a finger there and opening your mouth. They are ball and socket joints with a cartilage pad that acts as cushioning to prevent bone rubbing on bone. When the lower jaw (mandible) closes, the upper and lower teeth should meet smoothly and comfortably. This is your occlusion, also known more informally as your bite. A misaligned jaw can cause malocclusion: teeth meeting in an incorrect and unhealthy way (also called a bad bite). Many painful TMJ symptoms can result from a bad bite. The causes of TMD are not all fully understood. The jaw joint can be knocked out of position by a blow to the head as you might sustain in a sports or road accident. It can also be gradually pushed out of position – for example, by a tooth grinding habit, or by misaligned or crowded teeth constantly meeting in a bad bite. Bruxism is the medical term for grinding your teeth and clenching your jaw. Whether you do it in your sleep or just unconsciously throughout the day, bruxism exerts two to three times the normal amount of pressure on your TMJ. That constant pressure stresses the bones and muscles of your mouth as well as your jaw joint, not to mention the damage it does to your teeth. Bruxism can be a symptom of TMJ and a potential cause. Additionally, a severe overbite, under-bite, or a tooth that sits funny may affect the chewing action, stressing the jawbone and muscles of your mouth. These stresses can radiate and cause symptoms that do not seem associated with jaw pain, but they often are. Dr. Chung has extensive training and experience diagnosing TM joint disorders and treating the underlying causes of TMD. Headaches are one of the most common and problematic TMD symptoms. TMD headaches can cause severe and recurrent pain. Unfortunately, most general physicians don’t immediately think of TMJ disorder as a possible cause. A headache caused by temporomandibular joint disorder is usually a type of tension headache. A tension headache usually feels like you are wearing a hat that is two or three sizes too small. There are a few reasons that TMJ disorders cause tension headaches. When your muscles are constantly contracting due to a misaligned jaw joint, the muscle fibers grow and create tension or pressure in the face, neck, jaw, and shoulders. The tension restricts the blood flow to the region. The body, in turn, sends more blood, and this increases blood pressure in the head and can cause these tension headaches. Often, these headaches are so intense and frequent that they are misdiagnosed as migraines. Pain medication may relieve pain temporarily, but it will never get to the source of the problem. The only real way to fix the problem is to go to a neuromuscular dentist and have your jaw and its joints realigned and put in their optimal position. Dr. Chung can often offer a diagnosis and treatment plan for TMJ, finally giving you relief from your tension headaches. In addition to headaches, you can experience various TMJ symptoms across your body. Since other maladies and disorders can cause many of these same symptoms, it is crucial to obtain a correct TMD diagnosis and proper treatment. Jaw clicking: Another common TMD symptom is jaw clicks. Generally, the clicks are only felt and heard by the person suffering from TMD, but the clicks may be loud enough for others to hear. Over time the clicks may progressively get worse, resulting in further symptoms. Jaw locking: Frequently associated with jaw clicking, jaw locking can occur when the TMJ becomes so misaligned that the hinge catches. Usually, you have to move your jaw laterally to unlock it. Stiff jaw and facial pain: Overworked muscles ache and stiffen. With TMD, your muscles are often overworked, even while you are sleeping. If you grind your teeth at night, you may wake up with sore and stiff jaw muscles right around the TMJ. Sensitive teeth: This symptom is frequently associated with other causes of TMD like bruxism (teeth grinding and jaw clenching). If your teeth are inexplicably and generally sensitive, it may be due to TMD. Earaches and ringing in the ears: Because of the proximity of the TMJ to the structures of the ear, pain may radiate there. Other ear symptoms like tinnitus, or ringing of the ears, may be associated with TMD. Neck and shoulder pain: The pain from your misaligned jaw joints can radiate to your neck and shoulders as well. If you have shoulder pain, you probably wouldn’t think that a jaw issue could be causing your discomfort. The truth is, TMJ can cause symptoms in some unexpected places. Dr. Chung has completed training at the Las Vegas Institute for Advanced Dental Studies, known as LVI. LVI is the school of choice for post-graduate dentistry, and offers intensive training in neuromuscular dentistry, among other things. 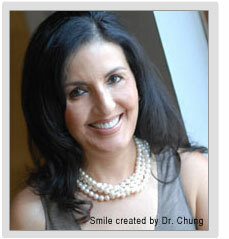 Dr. Chung has extensive experience in diagnosing and treating TMD in Northern Virginia. Many people who come to us with TMD symptoms have had those symptoms for a long time. In many cases, neuromuscular dentistry provides a solution to the pain of temporomandibular joint dysfunction. As a highly-qualified neuromuscular dentist, Dr. Chung has invested in sophisticated equipment for diagnosing and treating TMJ. This equipment includes the 3D Cone Beam Dental Scanner and the K7 Evaluation System. Data on your jaw movements: A misaligned jaw joint will move the mandible (lower jaw) in an uncomfortable or painful way, preventing the upper and lower teeth from coming together smoothly. The K7 system tracks and records your jaw movements. Data on your jaw muscle activity: If you have TMD, your jaw muscles are in constant stress, and their electrical activity can be measured and recorded using electrodes. Data on your jaw joint sounds: One of the TMD symptoms is jaw joint cracking or popping sounds. The K7 System will record the sounds as your lower jaw moves so that we can better understand how the ball on the lower jaw is moving in the upper jaw socket. There is a cartilage pad in between the two bone surfaces which prevents them from rubbing directly against each other. It could be out of position. Another diagnostic tool Dr. Chung uses is our tomography machine, which makes digital images of the jaw joint and its related structures. This gives us more data about how the lower and upper jaw bones are positioned in relation to each other. Pain relief often occurs during the first steps of testing for TMD. If you have any of the above symptoms, you might have seen several doctors and taken various medications for pain relief. They may have been temporarily effective, but most doctors do not look for dental causes of pain. It is a good idea to visit a neuromuscular dentist to investigate the potential of TMD. If you learn that you do have TMD, your search for relief will finally be over. After performing diagnostic tests to determine if you have TMJ, Dr. Chung will use a TENS unit (Transcutaneous Electrical Nerve Stimulation), with its small electrodes, to gently exercise your jaw muscles until they relax. When they relax, your jaw will be in its correct position, hopefully giving you some immediate relief. The goal of your ongoing treatment will be to make that relaxed position permanent. Every case of TMD is unique, and your TMJ treatment plan will be yours alone. The first step of TMD treatment is measuring and recording your relaxed jaw position. In a person who has had TMD for some years, the lower jaw has probably not relaxed for a long time. But a permanently relaxed lower jaw is the goal of TMJ treatment. Once Dr. Chung knows exactly where your relaxed jaw position is, he can determine what steps will be helpful in making that position permanent. Most TMD treatments at our Northern Virginia office have several components, and we customize each treatment to the patient. Our experienced neuromuscular dentist will determine the best treatment options for you. Dental work: A misaligned jaw usually goes along with misaligned teeth. Dr. Chung will work on your bite, potentially reshape or reposition some teeth, replace any missing teeth, and possibly recommend porcelain tooth crowns. The goal is to have your upper and lower teeth meet correctly, without bumping or wearing on each other. An orthotic: Your jaw muscles may need some retraining to correct their habitual movements. If that is the case, Dr. Chung will devise a customized appliance for you to wear temporarily. Physical therapy: Sometimes physical therapy is helpful to relax the whole jaw area – face, neck, and shoulders – and to help you relearn how to use the muscles related to the jaw. Pain medication will likely be prescribed until your pain level has dropped. TMD headaches are severe, and if you’ve been suffering from those for some time, it might take a while for them to fade completely. There could be other elements in your customized neuromuscular dentistry treatment plan depending on what the cause of your TMD is. In the process of treating your TMD, you might also see an improvement in the appearance of your smile, as Dr. Chung keeps aesthetic considerations in mind in all his dental work. Read more about TMJ disorder on our blog! In these days of advanced neuromuscular dentistry, you do not need to live with TMD pain. Contact Softouch Dental Care today by calling 703-319-6990 to schedule a consultation with our Northern Virginia area TMJ dentist Dr. Chung. We happily welcome patients from Oakton, Vienna, McLean, and surrounding communities.